You will have noticed that pumpkins are popping up again, craftfully carved in the shape of distorted faces lit from the inside by candles. Yes, it is Halloween. Some will tell you that Halloween has been imported from the USA, as so many other ingedients of our culture. Don’t believe them. Halloween, a contraction of “All Hallows’ Evening”, also known as “All Hallows’ Eve”, refers to a centuries’ old heathen Gaelic ritual that was the intro to the period of the year when the death were celebrated. It was believed that the ritual, consisting of dressing up, eating and drinking (are not all rituals made up of these ingredients?) could bring back the souls of the death on this day at the end of October. The Gaelic feast with Welsh influences that marks the end of the harvest and the start of the winter, has been transmuted into a Christian celebration. On a personal level, I remember as a child that this was also the day that traditionally the winter cloths came out of the closet, or in the best case new winter cloths were bought. The weather didn’t matter: the time of the year was more important than the thermometer level. I also recall that I carved a turnip in the shape of a head and put a candle in it, and vaguely I still smell the burnt black turnip flesh. Yes, a turnip, and not a pumpkin as we do nowadays. That is where the influence of the USA shows: when the tradition crossed the Atlantic Ocean to the West, the colonists favored the pumpkin above the turnip to demonstrate their respect to the souls of the death, because the pumpkin was more available and probably also because it lends itself more easily for the carving activities than a turnip. 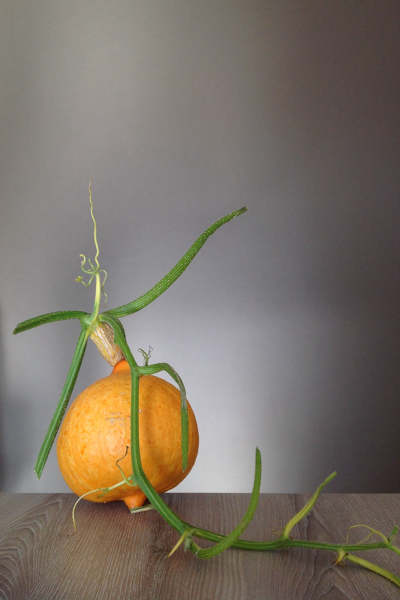 In any case, the pumpkin below that we harvested with kind permission of our neighbour, will end up in a delicious soup and not as the ornament in a ritual that as many other has become foremost a commercial happening.